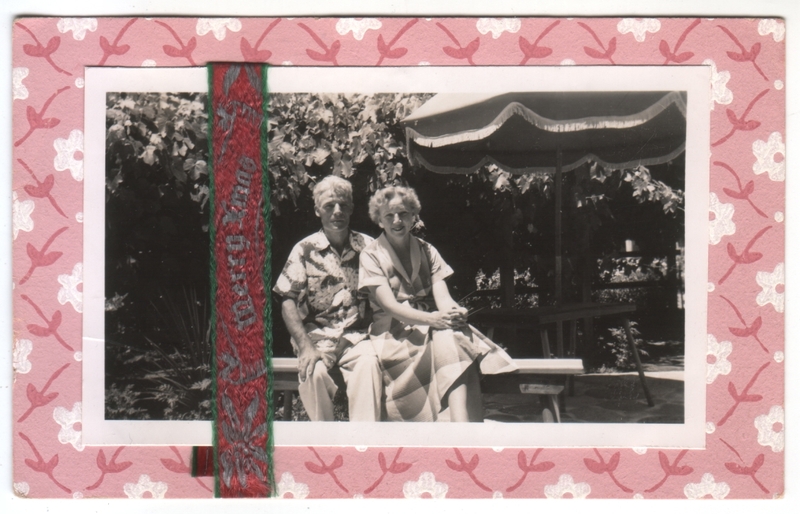 Handmade collage of a photo (4.5 x 2.75 inches) with a ribbon folded over it, pasted to decorative card stock. The ribbon says Merry Xmas. Otherwise undated and unidentified. Okay, this is probably just their back yard rather than a vacation resort, but they look quite at leisure. (I nearly titled this post “Christmas Greetings from Retirement”, though that would have involved another assumption.) I realize it’s perfectly normal to use ordinary non-Christmas photos for Christmas cards, but this one amuses me in the way it seems so un-Christmasy, or at least unseasonal (unless they are from the southern hemisphere). Still, it’s a flattering photo of this attractive couple, without being too stuffy and formal, so I can see why they picked it. Incidentally, that’s two-sided card stock, with the pink and white floral pattern on the back, too. Very pretty! Could the card paper have been handmade? It looks painted or hand-printed from here. It could very well be. I would guess hand-printed or at least painted with some sort of template, rather than painted free-hand, but it has some texture to it. Floridians or Southern Californians, quietly rubbing their good weather in their friends’ faces. The holidays have always been a time for bragging. Happy, merry, and bright to you, and thanks for all the great photos! Yep. No need to send a Christmas form letter bragging about the good life you’re leading when the photo says it all. Happy Holidays to you, too, Paul! Thanks for contributing so much to my blog, and I’m looking forward to more of yours, too! I do think they’re in California or Florida — look at the guy’s shirt. I love this image. To me, it just recalls a time when that was the life to have. 🙂 Happy Holidays, Matt! I wouldn’t mind having that life now, too! 🙂 Happy Holidays to you, too, Katie!